IDF declares illegally-built Bedouin encampment near Jerusalem a closed military zone, blocks EU envoys from visiting. Israeli security forces blocked a delegation of European Union officials from entering an illegal Arab encampment slated for demolition on Thursday, as EU and United Nations officials demanded Israel retroactively legalize the town and grant ownership of the land to the squatters living there. Israel is preparing for the demolition of the illegal community, known as Khan al-Ahmar, a Bedouin encampment with just over 170 residents east of Jerusalem. The town was built without any building permits or authorization, and sits in part on land belonging to the nearby Israeli community of Kfar Adumim. First built in the 1990s, Khan al-Ahmar has received assistance from European governments to build illegal structures, including a school. Years of legal battles culminated in a Supreme Court ruling upholding lower courts’ decisions which found Khan al-Ahmar to be illegal. The court ordered the government to evacuate residents and demolish the town. In May, the Israeli Supreme Court rejected the final appeals made on Khan al-Ahmar’s behalf, paving the way for its removal. Nevertheless, both the United Nations and European Union have condemned the demolition orders, and called on Israel to retroactively legalize the town and grant it full recognition. On Wednesday, the United Nations High Commissioner for Human Rights demanded Israel legalize the town, claiming that Israel lacked authority to enforce construction laws in Judea and Samaria. Later on Wednesday, the European Union External Action Service, the EU’s diplomatic arm, offered its own condemnation of the demolition orders. “These demolitions, together with plans for new settlement construction for Israelis in the same area, exacerbate threats to the viability of the two-state solution and further undermine prospects for a lasting peace,” the EEAS said in a statement. Israeli forces began preparations for the evacuation Wednesday, positioning equipment and bulldozers needed for the demolitions near Khan al-Ahmar. Eviction notices were distributed to residents. On Thursday, Israeli forces built a temporary road to the town, enabling bulldozers and other heavy equipment to be deployed there for the impending evacuation. 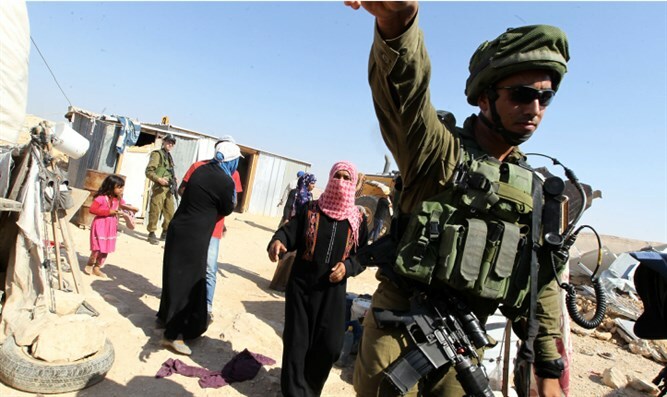 During the preliminary work for the evacuation, Israeli forces declared the area a closed military zone, authorizing them to remove squatters and bar entry to activists looking to prevent the evacuation. A delegation of European diplomats attempted to enter Khan al-Ahmar while the preliminary evacuation work was underway. The European officials were barred from entering the town, and told by Israeli authorities that the site had been declared off-limits. According to a report by AFP, representatives from France, Finland, Belgium, Spain, Ireland, Italy, Switzerland, and the European Union were part of the delegation which attempted to enter Khan al-Ahmar.